Hydrangea quercifolia are oak-leaved Hydrangea. Deciduous shrubs many displaying brillant autumn colours and have panicles of very showy and cone-shaped flowers. Native of south eastern United States. 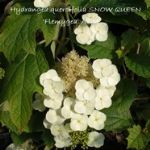 Hydrangea quercifolia flowers are the same colour in all soil types. Most Hydrangea quercifolia form round bushes between 1m and 3m tall. Hydrangea quercifolia only need minimal pruning in spring to remove dead heads and to reshape the bush. Oak leaved Hydrangea with mid green leaves turning bronze-red in autumn and large cone shaped cream to pink flowers. Available to pre order now for delivery May June 2019. Oak leaved Hydrangea with creamy white flowers turning to dark amethyst red. Available to pre order now for delivery May June 2019. Oak leaved Hydrangea with mid green leaves turning bronze-red in autumn and creamy-white flowers. Available to pre order now for delivery May June 2019. Oak leaved Hydrangea with mid green oak shaped leaves turning bronze-red in autumn and creamy white flowers. Available to pre order now for delivery May June 2019. Oak leaved Hydrangea with mid green leaves turning red-bronze in autumn and long pointed white flowers. Available to pre order now for delivery May June 2019. Oak leaved Hydrangea with large double white flowers in mid summer. Available to pre order now for delivery May June 2019. Conical pure white flowers and slivery tinged green oak shaped leaves turning rich red in autumn. Oak leaved Hydrangea with yellow leaves and white flowers in summer. Available to pre order now for delivery May June 2019. Oak leaved Hydrangea with green leaves turning bronze yellow purple in autumn and conical white flowers. Available to pre order now for delivery May June 2019. Oak leaved Hydrangea with green leaves turning bronze-red in autumn and creamy-white flowers. Available to pre order now for delivery May June 2019. Oak shaped leaves with double white flowers fading to pink. Available to pre order now for delivery May June 2019. Oak leaved Hydrangea with double white flowers in summer & bronze red leaves in autumn. Available to pre order now for delivery May June 2019. Oak leaved Hydrangea with white flowers in summer turning to pink with age. Available to pre order now for delivery May June 2019.